Serum pepsinogen (PG) measurement has been used for gastric cancer screening since the 1990s. However, there are no reports comparing the screening validity of the PG test method with that of conventional X-ray examination directly in the same population, using a follow-up study. From April 2000 to March 2001, 12 120 residents of Osaka Prefecture, who underwent opportunistic screening at a medical checkup organization in Osaka city (hereafter, “the organization”), were enrolled. They received both a barium meal examination and PG test simultaneously. All the participants were followed up for a 1-year period after the screening. For the participants advised to undergo endoscopic examination, the results of those who were examined at the organization were tallied. The other participants were checked using the Osaka Cancer Registry (hereafter, “the registry”). Of the 12 120 participants, 493 (4.1%) were positive with the PG method and 728 (6.0%) were positive with the X-ray method. Fifty-four (0.4%) were positive for both methods. 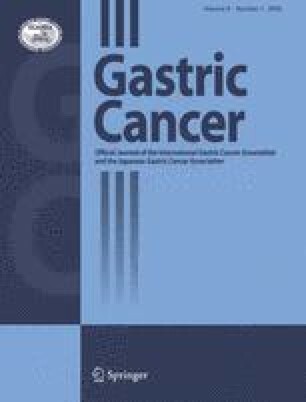 Thirteen gastric cancer cases were diagnosed by successive esophagogastroduodenoscopies at the organization. Six additional gastric cancer cases were identified by record linkage with the registry. The sensitivity, specificity, and positive predictive values of the PG method with a PGI cutoff level of ≤30 ng/ml and PGI/PGII ratio of ≤2.0 were 36.8%, 96.0%, and 1.4%, respectively. These values for the direct X-ray examination were 68.4%, 94.1%, and 1.8%, respectively. The PG test method alone with a PGI cutoff level of ≤30 ng/ml and PGI/PGII ≤ 2.0 is not appropriate for gastric cancer screening.